We are overwhelmed with joy at the number of requests for the Pet Respirator Kits. Unfortunately at this time we no longer supply pet respirators. This was a year long project with a limited amount of respirators to donate. Are you a fire fighter, an EMT, or a police officer? Do you lack the proper equipment to save family pets in a fire or automobile accident? Ryan's Fund can help. Ryan's Fund purchased a number of pet respirator kits, also known as Recovery O2 masks, to donate to first responders. The respirators are easy to use and come in three sizes. They can be used to provide life-saving oxygen at fire scenes and other emergencies to pets ranging in size from a small bird to a large dog. Bolton Veterinary Hospital has partnered with Ryan's Fund to provide free pet rescue training to recipients of the Recovery O2 masks. Ryan's Fund urges the pet owner community to order pet rescue stickers for placement in a window of the home to alert emergency personnel that a pet family member is living in your household. To obtain a free pet rescue sticker from the ASPCA, follow this link. You will be directed to the ASPCA website. Use your browser's Back button to return to this website. 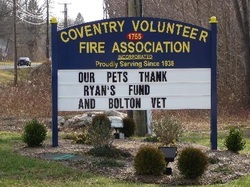 Ryan's Fund made the kick-off donation of pet respirator kits (Recovery O2 masks) to Coventry Volunteer Fire Department on December 20, 2006. The donation ceremony was followed by a pet rescue training session offered to fire fighters at no charge by Dr. Edward Grace and Andrea McDonald of Bolton Veterinary Hospital. "In May 2003, Brian, Autumn and I lost everything in a house fire in Cromwell, CT and, due to our injuries sustained in the fire, we were not able to help our kitties. The fast, compassionate and much-appreciated response of the firefighters to rescue many of our cats, and to promptly transport them to the veterinarian for oxygen and other treatment, lead to the complete recovery of our 'babies'. Knowing that we really didn't lose everything, our healing process was eased, especially that of our young daughter. We strongly support the effort to outfit the firefighters with pet oxygen masks so other families may be as lucky as we were."